The BeatsX are a solid pair of in-ear headphones. They might not have the highest clarity out of all the headphones we've tested, but that’s something they make up for with supreme comfort, smart iOS integration and a surprisingly effective Quick Charge feature. Beats by Dre has long been a traditional headphone maker, but the BeatsX are a different breed. That's because rather than sticking to bass-heavy workout earbuds or wildly expensive over-ears, the company has dreamed up a new pair of musically inclined in-ears for anyone already sick of losing their brand-new Apple AirPods. Although they're a bit different, the BeatsX borrows a lot from previous Beats products. For example, the headphones have a flat, no-tangle cable and stellar compatibility with iOS devices. But they also carve out their own niche as one of the first balanced pair of headphones from the low-end loving company. But BeatsX has a few tricks up its sleeve that not many headsets from Apple or Beats by Dre have had before: Quick Charge. This is a feature that allows your new ‘buds to last up to two hours from a single five-minute charge, and Apple’s new W1 wireless chip. We’ll talk about what the W1 does in explicit detail later on in the review, but we’ll preface that conversation by saying that it vastly improves the BeatsX’s battery life and performance over Bluetooth. One carry-over from previous generations, however, is its pricing – the BeatsX are not what we’d consider an affordable pair of in-ear headphones. They cost $149 / £129 / AU$199, which is a far bit more expensive than similar sounding wireless in-ear earbuds – including our favorite pair of gym buddies, the Optoma NuForce BE Sport3 – but less expensive than other wireless headphones made by Beats, thankfully. So, are the new BeatsX pound-for-pound the best headphone from Apple? 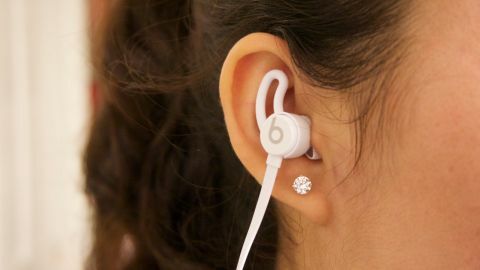 As of late, in-ear headphones have taken one of three designs. They’re either fully wired in-ears that connect the drivers to a 3.5mm jack; two fully wireless earbuds that connect to one another through Bluetooth; or two earbuds connected via a cable that wraps behind your neck. The BeatsX fall into the last category. Having the two earbuds connected via a cable might not sound like the ideal solution to some – afterall, a cable has the tendency to weigh the earbuds down – but it’s not without its advantages. First and foremost of those is the fact that they’re harder to lose than fully wireless earbuds. The second is that the wire between the two buds can provide a home to in-line controls and a battery, allowing the headphones to last longer between charges and allow you to communicate with Siri. The in-line controls here are just the way we like them: basic but effective. You can use them the raise and lower the volume, pause the music, skip tracks and rewind. There’s also a built-in microphone that you can use to make calls – something we’ll touch on later in the review. If you’re afraid the cable might feel uncomfortable, let us allay your fears – the BeatsX is absolutely one of the most comfortable pair of wireless in-ears we’ve ever worn. It conforms naturally to the neck thanks to the flat cable, and don’t really get in the way. The solution here is to carry most of the weight in the thickest part of the cable that sits around your neck, leaving two smaller cables with earbuds attached to run up to your ears. This technique helps the BeatsX sit snugly in the ear without giving you the feeling that they’re about to fall out. As for the in-ear fit, Apple ships each package with four different eartips and two sets of wings that help hold the headphones in place while you’re working out. Speaking of workouts, the BeatsX is water-resistant, but not fully waterproof. In practice that means you can take the BeatsX with you on a sweaty trip to the gym without fearing for their safety ... as long as you avoid taking them into the pool. When they’re outside of your ear and loosely hanging on your chest, the earbuds will snap together thanks to built-in magnets that help keep the wires from getting tangled – a neat, novel feature if we’ve ever seen one. If you want to match your BeatsX to your gym bag, the headphones come in four colors: Black, White, Grey and Blue. While a pair of black headphones might make the most sense given the amount of sweat, dust and dirt they’re likely to attract in your bag, we can’t help but feel particularly attracted to the Grey and Blue variants – the black sheep of the group. Design-wise the BeatsX have three advantages over the AirPods. First off, they’re much harder to lose. Second they have a longer battery life – about eight hours on the BeatsX compared to the AirPods’ six. And, finally, the four sets of eartips give you a greater chance of finding the right fit compared to the AirPods’ one-size-fits-all approach. Call us whatever name you like – cheap, frugal, thrifty – but we expect a lot in terms of sound quality from a $149 pair of headphones. And while the BeatsX hits a few of the right notes – especially in terms of achieving tonal balance – it’s not quite pitch-perfect for the price. But before we hammer home where BeatsX goes off-key, let’s focus on the high notes. The sound quality is actually relatively clear for a pair of in-ear drivers. You won’t find shimmering highs and sparkling mid-ranges here, but the sound is far from flat or hissy. What was more surprising was the overall balance Apple achieved here – mids, highs and lows are on the same keel. Highs and lows could’ve been even more pronounced than they are – but we never thought we’d live to see a Beats pair of headphones taking the middle ground. Where the ‘phones falter is when it comes time to seal sound out. Even with a seemingly airtight seal, we could still hear most of the conversation going on around us. We weren’t expecting a Bose QC 30-level of noise-cancellation, but we don’t think it’s not too much to ask for some passive noise-cancellation. If you’re looking for a ton of bass, though, and we can’t believe we’re saying this, you won’t find it on this pair of Beats – Levels by Avicii was relatively tame, while Little Black Submarine by The Black Keys lacked that punch and panache we’ve heard while using other pairs of cans. To most audiophiles out there, this news won’t upset you. But for the people used to a pair of Beats sounding like the inside of a woofer, you might be a tad disappointed. What we really would’ve liked though was more clarity. Nothing sounded dull or drab, but there was a definite lack of energy here. In terms of quality we’d put them right alongside the Klipsch Reference X6i – a solid, middle-of-the-road pair of in-ear headphones from 2016. As we mentioned in the beginning of the review, the BeatsX can also be used to field calls and pull up Siri. Using the BeatsX as a Bluetooth headset is a surprisingly easy affair with one click on the in-line remote to answer calls and two clicks to hang up. In terms of call clarity, everyone we spoke to said we sounded clearer while using the BeatsX headphones than we did using the iPhone SE microphone, if slightly quieter. While we’re not major fans of Apple’s propagation of strange, new, proprietary technology (cough, Lightning Cables, cough), we do have a fondness for the new W1 Chip. It is, undoubtedly, the brains behind the wireless operation inside the BeatsX. It helps the the headset sync up seamlessly to iOS devices and helps preserve battery life. Strange, yes, but it is supremely easy to use. Holding an unpaired BeatsX next to iPhone brings up a prompt asking you if you’d like to pair the headphones. Click yes and it will pull your name from your phone – in our case, renaming itself “Nick’s BeatsX”. As far as we can tell, this works with any number of iOS devices including Apple Watch and iPads – though it didn’t pull up a prompt on our slightly older Macbook Pro. For Android users accustomed to using NFC to pair their devices, this might not be a ground-breaking feature (few things that come from Apple are). But for iOS users used to struggling to pair headphones, we appreciate the usability improvements the W1 Chip brings. In terms of battery life, the W1 also adds a je ne sais quoi that helps squeeze extra performance from built-in batteries. The Apple AirPods, which also use the W1 Chip, last for about six hours between charges, while the the BeatsX goes on for about eight hours before it needs to refuel. Our testing showed that it can last slightly longer than the eight hours it’s rated for, but that number may drop down after a certain number of Quick Charge sessions. Speaking of Quick Charge, the feature worked exactly as expected, providing roughly a 25% charge in five minutes or less. Now, you’re forced to use a Lightning Cable to charge the headphones instead of something a bit more universal like USB-C, but as long as you don’t mind keeping a new cable with you your headphones can stay charged at all times. While we still wouldn’t use the word stylish to ever describe in-ear headphones, the BeatsX makes a pretty compelling case to get us to start. That said, whatever you make of the design’s aesthetics, it’s still incredibly comfortable to wear for long periods at a time. The 8-hour battery life is conducive to longer listening sessions plus, when you run out of juice, it just takes a few minutes to boost the headset back to 25%. While sound quality is decent and well balanced for a Beats branded headphone, it’s still not where we’d want it for the price tag. There are simply better-sounding options out there that cost less. While the headset does a decent job of stopping the music you’re listening to from escaping, it doesn’t do a great job of keeping exterior noise out. Finally, while we didn’t mind carrying around a Lightning Cable to charge the headphones for the duration of the review, Android and Windows phone users might not be as receptive to adding another cord to their bags. The BeatsX caters to two different but sometimes very much the same camps. First, it will almost certainly resonate with the workout crowd who are looking for a solid-fitting pair of in-ears that sound decent and won’t weigh them down. But second, and more surprisingly, the headphones will also appeal to your standard music listener – the kind of person just looking for a pair of in-ears for a long commute. There are some obvious issues with sealing out noise here, but those aren’t unforgivable considering a decent trade-off in terms of battery life and excellent iOS integration. If you’re looking for a no-fuss pair of earbuds and don’t mind dropping some cash on them, the BeatsX are for you. If you’re a cheap, frugal or thrifty audiophile like we are, however, there are higher quality options out there for less.